If your grocery budget is tight but you want to dive into keto, don’t worry. Eating a high-quality ketogenic diet on a budget is more than possible. It just takes a little extra planning and getting clever with available resources. Many find that after the initial investment from overhauling their kitchen cupboards, they end up saving money on a low carb diet. This post will give you tips on how to save money (in both the short and long term) and how to calculate your “return on investment” by following keto. Following a strict budget? These ten tips should help you stay on track financially. When trying to save money grocery shopping, buying in bulk can make a serious impact. It’s tempting to shop at Whole Foods for your items — or even your regular local grocery store — but you won’t find the bargain prices you would at wholesale stores like Costco, Walmart, or Sam’s Club. Other affordable stores include Aldi and Trader Joes (which, as it so happens, is owned by the same company). Finally, search local farmers markets for a butcher or farmer who offers a CSA or subscription-based program. When you find a good deal, take advantage! Stock up, purchasing items like coconut milk, seasonings, and pantry essentials by the case, rather than the item. Meat and seafood can put a serious dent in your bill, so if you find meat on sale, purchase more than you need and freeze what you don’t use. Buy several bags of cheap (in price, not in value) frozen vegetables and store them. While you might prefer the taste of fresh produce, frozen veggies are extremely affordable, make an excellent dinner even when the fridge and cupboards are empty (frozen veggies make a great stir fry! ), and prevent food waste. If you’re already buying the food in bulk amounts, cook in bulk too. Batch cooking is an awesome way to ensure you always have meals and snacks in the house. Not only does this save you money, it saves you time. Choose one day each week to meal prep. Sunday works for most people, but it might be a different day depending on your schedule. Spend the day grocery shopping, jotting down a meal plan, cooking, and portioning out meals into easy, grab-n-go containers. If you cook more than you can consume in one week, simply freeze what you do not use. If you have the space available, some people find that a deep freezer is a worthwhile investment. It allows you to batch cook well in advance, and store those budget-friendly finds. When you shop at the grocery store, use deals and discounts to your advantage. When meat nears its expiration date, stores will often discount it by as much as 20%. If you’re meal prepping that very day, this is an opportunity to find high-quality, grass-fed meat at incredibly low prices. BOGO (buy one, get one) deals are another common grocery store promotion. Search for BOGO deals in the produce and butcher sections, then scan the aisles for offers related to pantry staples. You can save a lot of money this way, so get used to keeping your eyes peeled for a good deal. Without a clear list of what you plan to buy, there’s a 99.9% chance you will buy more than planned. Impulse buys are a real thing. Go to the store with a list (and only buy what’s on that list) to stick to your budget. A FoodSaver is a vacuum intended to seal and extract air from plastic bags. By using a FoodSaver, you can freeze meals and prevent freezer burn. An added bonus? It frees up space in the freezer, which you’ll need for bulk buying and cooking. If you can’t find deals locally, shopping online can save a tremendous amount of money. Amazon.com has plenty of low-priced offers on nuts, almond flour, coconut flour, coconut oil, flax or chia seeds, and spices. These are often cheaper to buy online than in the store, even with shipping. Amazon Prime offers two-day shipping, and you can subscribe to certain products to have them routinely delivered to your doorstep. Another online source is Thrive Market, which has a similar business model to Amazon. Unlike Amazon, Thrive Market only focuses on organic, niche items (think Whole Foods without the Whole Foods prices). Another online resource is Nuts.com where you can buy nuts in bulk online for a discounted price. Finally, there are plenty of places to buy grass-fed meat online (ButcherBox comes highly recommended) within a subscription plan. When it comes to produce, there is a very wide range of cost per pound. Broccoli, green beans, and spinach are fairly affordable options, and can be incorporated into almost any recipe. Cauliflower is typically more expensive, but is extremely versatile and can be well worth the cost. Other items, like red bell peppers, avocados, or orange bell peppers, are usually more expensive. The same can be said for meat and seafood. Is filet mignon expensive? Absolutely — so don’t buy it. Buy affordable cuts of meat like bone-in, skin-on chicken thighs, ground beef, cod, tilapia, and nitrate-free bacon. Eggs are also incredibly affordable, and hard-boiled eggs make for a great keto-friendly snack option. If you’re complaining about your food bill but still spend $5 every single day on a latte, here’s a painful realization: That latte isn’t even food. And if you’re grabbing a $20 bottle of wine every time you hit the store (or worse, paying a $50 bar tab each Thursday at happy hour) those line items add up. Quit the pricey drinks and alcohol and switch to water. If you need caffeine, make your own coffee or tea at home and carry it in a mug. As for alcohol, you should probably cut back altogether (it’s full of sugar!). Salad dressings, dips, flours, salsas, guacamole, nut butters, soups, salads…as much as possible, make things from scratch. Not only will it save you money, but it will prevent you from eating food additives and added sugar. There are plenty of keto recipes available on this website (including recipes for condiments, sauces, and dressings) that you can work into your keto meal plan. Buy the whole chicken instead of boneless, skinless chicken breasts. Buy the whole stalk of celery instead of chopped up celery. Buy whole almonds instead of an almond trail mix. Buying food that isn’t “convenient” will be kinder to your wallet. This also goes for pre-chopped and frozen vegetables. Instead of spending more, take a little time to chop and store/freeze the veggies yourself. Eating keto does not have to break your wallet. Don’t let tight budget concerns keep you from making your health a priority. Use what you have to make this diet work for you, even if it takes a little extra planning and preparing. Pull out a piece of scrap paper and answer these questions to the best of your ability. Don’t spend too much time on it. What are your meals like on keto vs. non-keto? Are you eating less volume and less frequently? What are your beverages like? Are you consuming less alcohol and caffeine? What are your snacks like? Are you eating fewer snacks due to fewer blood sugar spikes and crashes? 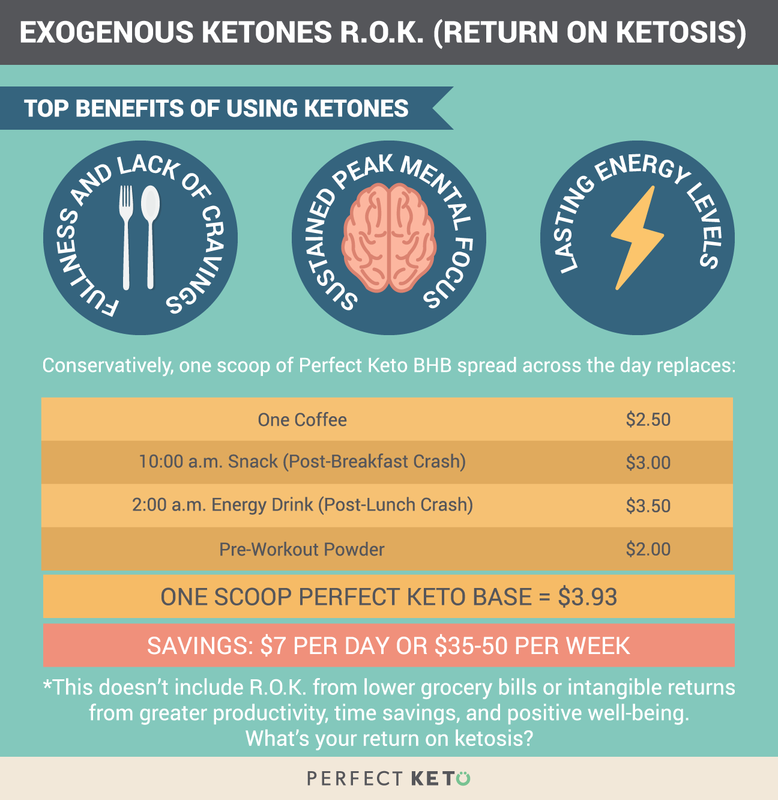 The benefits of ketosis are mental, physical, and psychological. A mental benefit might be improved clarity and focus, while a physical benefit might be fat burning, improved athletic performance, or weight loss. A psychological benefit would be fewer mood swings or a heightened sense of well-being. How does this increased productivity, clarity, and well-being affect your bottom line? How would a longer, healthier life increase your lifetime earning potential? Those added benefits are the return for the investment in your health. Take these 10 practical tips for keto on a budget, give it one month, then assess. How much did you spend? How do you feel? Are you more productive, do your workouts feel better, and do you feel better about yourself? Ask yourself this question: Is the price of being healthy worth it? Don’t let budget concerns derail you. Many people in the first half of life waste their health trying to make money and then in the second half of life they spend the money trying to get their health back. It’s time to budget your time, energy, and hard-earned money into what really matters to you. Thanks for the post, can I set it up so I get an email every time you write a fresh update? Thanks, I really enjoyed this article. I’ve been doing keto for 7months and I’ve been wondering how to get the rest of my family into it. They aren’t opposed to it, its just that I have 5 kids and I was afraid of the cost. This gives me hope.